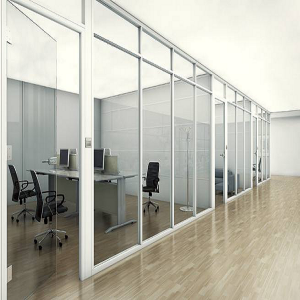 Partitions are walls that are designed to separate interior space，application more flexible and extensive, has been widely used in the development and utilization of architectural space. 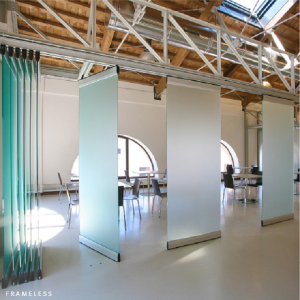 It can be divided into two categories: movable partition and fixed partition. Movable partition walls also can be called portable partition which can be rotated 360°and turn to anywhere, movable partition suitable height is 2m-17.6m, the track can withstand a weight of 325kg/m-1380kg/m ,fixed partitions are fixed on the ground and ceiling,wall insulation factor of 35db-55db, promote flexibility and one person can complete the entire process,according to different occupancy rates, the large space is divided into small spaces to reduce air-conditioning power consumption; efficient fire protection, fixed partition consists of plate, glass, frame material, sealing material and hardware, fixed partitions generally use glass styles, fixed glass partitions are partition walls made of toughened glass. 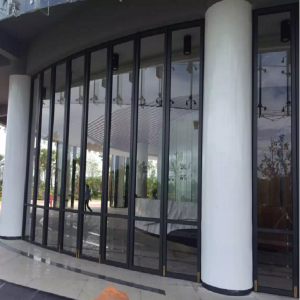 the glass materials are divided into the single-layer glass, double-layer glass and art glass. They are installed together with aluminum profiles, hardware, and sealing strips. the installation is quick and easy, green, and can be adjusted with the shutters.